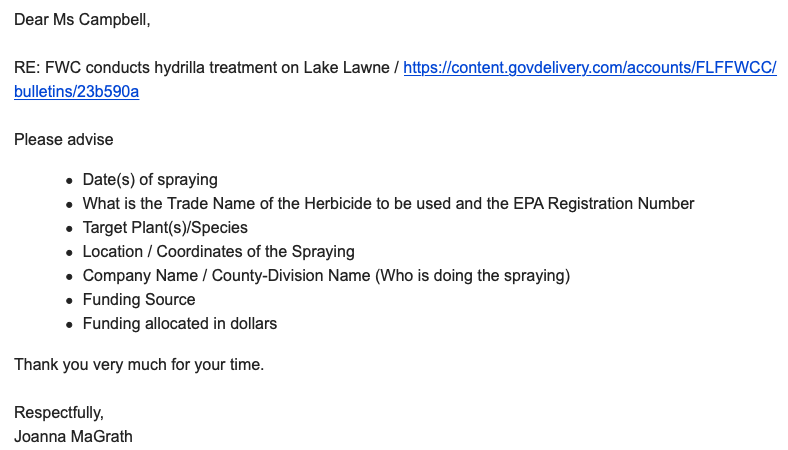 The Florida Fish and Wildlife Conservation Commission (FWC) is planning to treat hydrilla on Lake Lawne on April 4, weather permitting. 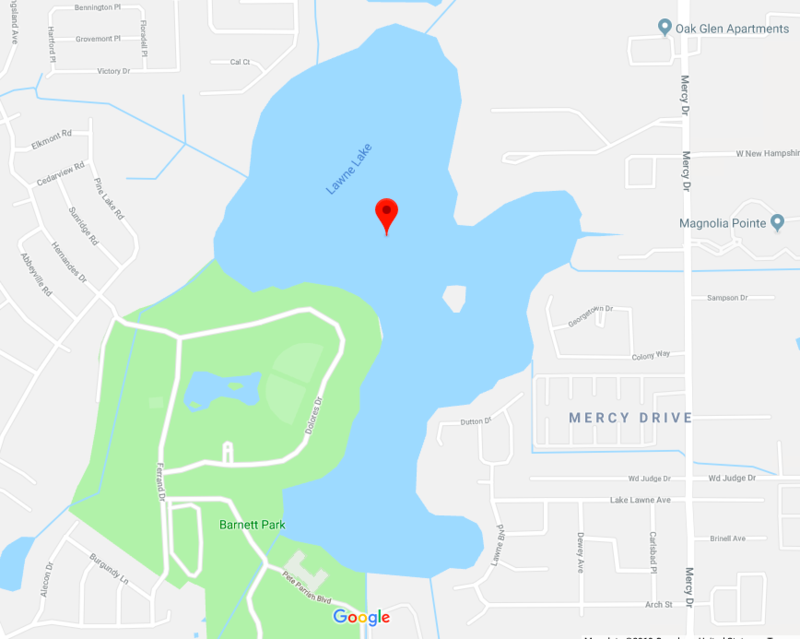 The FWC’s Invasive Plant Management Section will treat 146 acres of hydrilla on the Orange County lake, where this invasive plant species is encroaching on beneficial native submersed aquatic plants, and may impact access to navigation and flood protection. The herbicide being used for this treatment is Fluridone. This herbicide is approved for use in lakes by the U.S. Environmental Protection Agency and Florida Department of Agriculture and Consumer Services. There will be no restrictions on fishing and swimming in the lake during or after the treatment. However, there will be a 14-day restriction on using the treated water for irrigation. Turf, ornamental and newly seeded crops may be susceptible to waters irrigated from Lake Lawne, therefore it is recommended that home and property owners not irrigate from this waterbody for 14 days after treatment. ​Hydrilla is an invasive aquatic plant spread easily by boats throughout the state’s lakes and rivers. It can clog waterways, making recreational activities difficult or impossible, and competes with beneficial native plants. Managing and treating it is necessary for the health of Florida’s waters and to enable continued recreational boating and other aquatic activities. The FWC is aware that hydrilla can provide some benefit for wildlife, recreational anglers and waterfowl hunters, and tries to balance those benefits with the economic and environmental cost this plant has on our native plant communities. FWC staff currently is moving forward with implementing a variety of enhancements to the agency’s Aquatic Plant Management Program, based on input from recent public listening sessions. 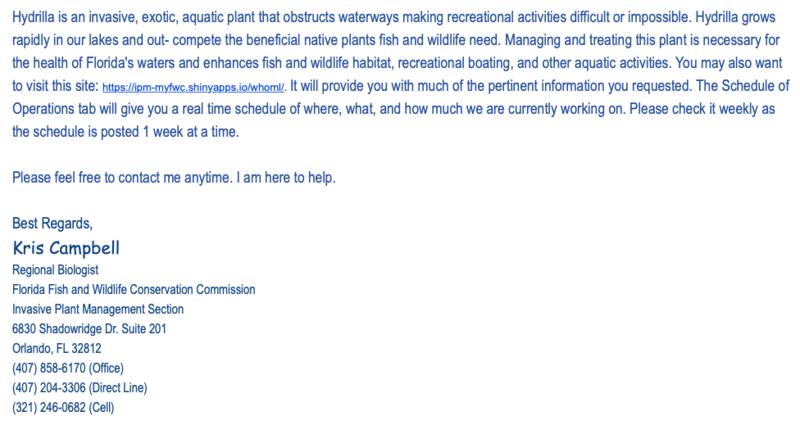 Go to MyFWC.com/AquaticPlants to find out more about invasive plant management. For general waterbody information, fishing forecasts, virtual tours, plant control operation schedules and annual workplans, boat ramp information, and more, visit the “What’s Happening on My Lake” website at MyFWC.com/Lake. 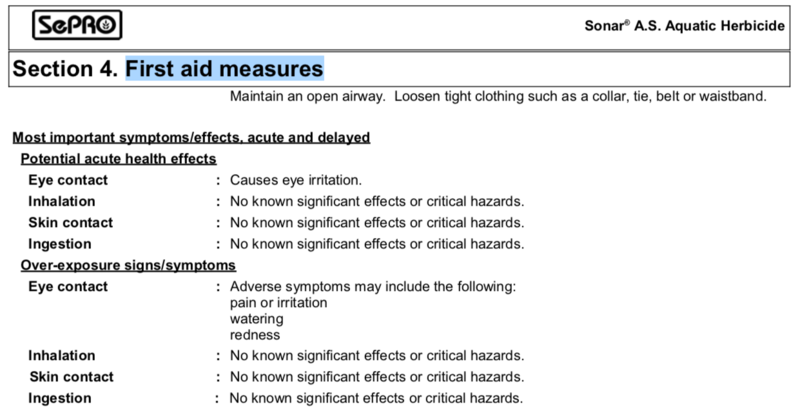 Sonar (Fluridone). Please contact SePro Corporation for the EPA Registration number. This is a whole lake treatment, therefore the entire shoreline will receive a submerged treatment. Our funding comes from General Revenue Fund ($600,000), Invasive Plant Control Trust Fund ($2,497,751), and the Land Acquisition Trust Fund ($30,233,647). Environmental precautions: Avoid dispersal of spilled material and runoff and contact with soil, waterways, drains and sewers. Inform the relevant authorities if the product has caused environmental pollution (sewers, waterways, soil or air). May be harmful to the environment if accidentally released in large quantities. Collect spillage. EYE IRRITATION - Category 2B - H320 - Causes eye irritation. 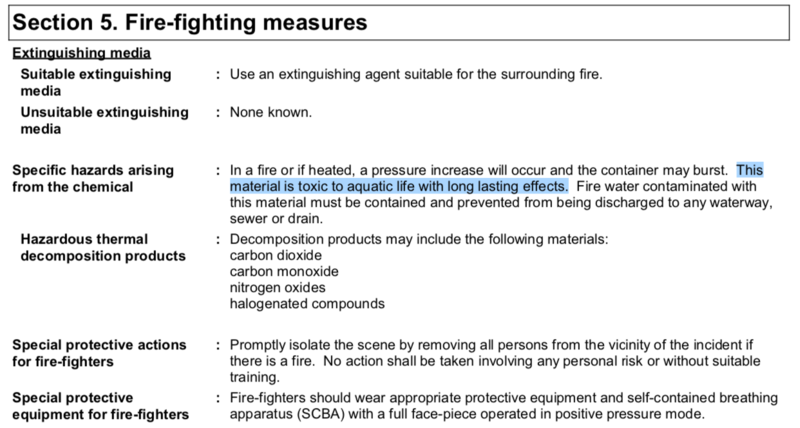 P273 - Avoid accidental release to the environment. 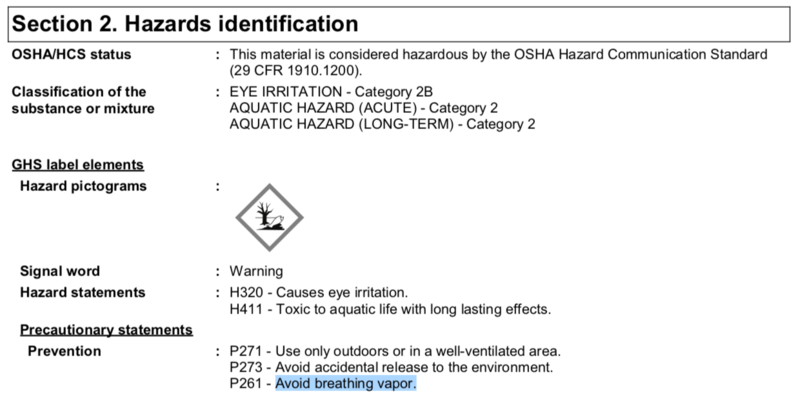 P261 - Avoid breathing vapor. Final determination of suitability of any material is the sole responsibility of the user. 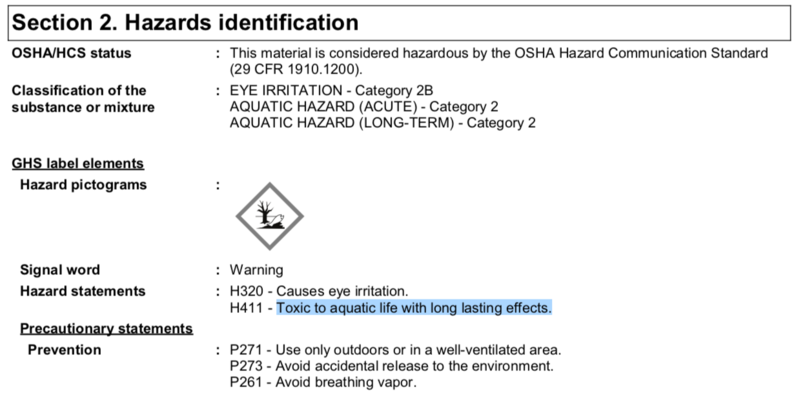 All materials may present unknown hazards and should be used with caution.Although certain hazards are described herein, we cannot guarantee that these are the only hazards that exist.